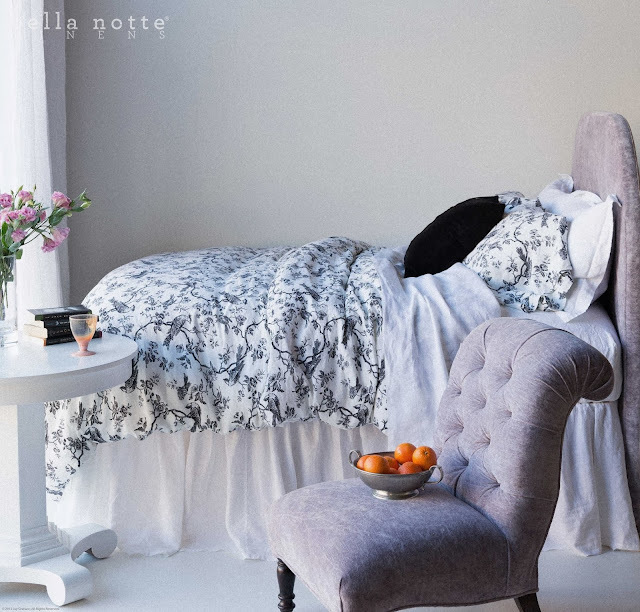 Meet Bella Notte Linens Bird Toile. New for Spring 2014, Bird Toile is a picturesque pattern with an elegant ebony menagerie on linen. Bella Notte Linens Bird Toile is offered in White, Champagne, and Sand, and is available on Quick Ship. Above. Bird Toile Duvet and Bird Toile Bolster in Champagne, paired with Ebony pillows, a Homespun Coverlet in Champagne and Valentina Curtain Panels in Champagne. Above. Bird Toile Duvet and Bird Toile Standard Pillowcases in White paired with a Linen Bedskirt in White, Linen sheets in White, and Linen Pillow Shams in White. Above. Bird Toile Duvet and Bird Toile Bolster in Champagne with Adele Throw Pillow in Ebony and Linen with Lace Throw Pillow in Ebony.